Potsdam, once Germany's most important town as residence of the German royal family, claims Frederick the Great (1712-1786) as its most flamboyant resident. Prussia's foremost king, whose official title was Frederick II, was a renowned patron of the arts, music, philosophy and architecture. He commissioned court architect Georg Wenzeslaus von Knobelsdorff to construct several palaces based on the king's architectural ideas. The splendour of Sanssouci Palace, Potsdam's outstanding masterpiece, draws on the fabulous Palace of Versailles in France. It stands on a hill in the middle of a 287-hectare landscape park and is probably Germany's best known example of rococo architecture. The royal palaces and gardens of Sanssouci are architectural highlights of Potsdam's rich cultural history. After an exciting visit to Berlin, it is time to relax in Potsdam. Follow in the footsteps of Frederick the Great and enjoy this unique architectural ensemble, the pride of Prussian Kings and German Emperors. This Arcadia of fine arts, set in one of Germany's most beautiful countrysides, provides a welcome tranquility after the hurly-burly of Berlin. Stroll down the old Dutch quarter with its quaint, red brick, two-story houses built between 1737 and 1742, and nearby Brandenburger Street, once home to Mozart. Seek out Alexandrowka, the Russian complex of a dozen half-timbered log cabins designed in the form of a St. Andrew's cross. These were once homes to Russian singers belonging to a choir that had remained in the Prussian army following the campaign against Napoleon. See the rebuilt Town Palace, the Church of St. Nicholas and the old Town Hall, all architectural marvels looking onto the Old Market. Today, the historic Royal Stables at the Old Market house Potsdam's Film Museum. Other interesting sights are the buildings of Filmstudio Babelsberg, the cradle of German cinema and still a major media center. Potsdam is a monument to Prussia's pomp and circumstance, a world that has sunk into political oblivion, but still retains most of its architectural fascination and allure to the present day. Visit the town, palaces, gardens and parks. Sanssouci Palace and Park is an exceptional masterpiece of Prussian Rococo. This dazzlingly beautiful palace was Frederick the Great´s favourite and, together with the nearby vineyards, offers a breathtaking feast to the eye. Its name translates as "without a care", and it was here that Old Fritz sought retreat into a life of philosophy and fine arts. The summer residence of this enlightened monarch was the setting for illustrious gatherings whose participants included diplomats, members of the officer corps, writers and philosophers, and which gave Frederick the Great the chance to show off his many talents - musician, composer, author and philosopher - and for his personality to sparkle. Prussia´s king not only resided at Sanssouci, but also died there in 1786, expressing a desire to be buried alongside his dogs next to the palace. This architectural masterwork has been a UNESCO World Cultural Heritage site since 1990. Art Gallery, Orangery, New Chambers and New Palace: Regal palaces set in a regal ambience. This collection of palaces and museums may differ in size, layout and use, but there's one thing they have in common: the elegance and finery of their interiors are, through their timeless beauty and authenticity, true highlights of 18th century architecture that have survived all wars and social unrest and whose grandeur and opulence will surprise and delight the visitor until today. Completed in 1769, the New Palace was the last royal residence built by Frederick the Great and owing to its more than 200 rooms, it is also the largest palace ensemble in Sanssouci. Architectural highlights are the Marble Hall, Grotto Hall and the Concert Room. An exotic pavilion, a fine example of Chinese design that reflects the popularity of Chinoiserie, the architecture, art and decoration trends that came to Europe in the late 17th century and prevailed until the end of the 18th century. Shimmering amidst the golden shades of Sanssouci's park, this pavilion, maintained in Frederick the Great's favourite colours, gold and green, invites one to stay a while and gives visitors a chance to dream. It once offered an exotic setting for small gatherings and festivities. This mix of architectural clichés of Rococo and Far Eastern design was not only the heyday of the architectural fashion style in the 18th century, but also the king's personal preference. The Cecilienhof Palace: Where history dwells. The Cecilienhof Palace, built between 1913 and 1917 by Emperor Wilhelm II for his eldest son, Crown Prince Wilhelm and his consort, Crown Princess Cecilia, is situated in the northern part of the "Neuer Garten". Constructed in the style of an English Tudor country house, it was the last palace to be built by the Hohenzollern dynasty. It is best known as the venue of the Potsdam Conference, held between the 17th of July and the 2nd of August 1945, at which the allied powers, represented by Joseph Stalin, Harry S. Truman and Winston Churchill (later replaced by Clement Attlee), concluded some agreements: they determined the division of Germany and Berlin into four occupation zones, the prosecution of Nazi war criminals, they stipulated war reparations to the Soviet Union from their zone of occupation in Germany and, finally, they established the new post-war order and the demilitarization, denazification, democratization and decentralization of a defeated Germany. 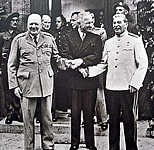 However, due to the ambiguous wording of the Potsdam Agreement, many historians claim that the last conference of the “Big Three” set the stage for the ensuing Cold War. Built between 1787 and 1792, the Marble Palace was the first neoclassical palace in Potsdam. This project was initiated by architect Carl von Gontard and later completed by Carl Gotthard Langhans, the architect of the Brandenburg Gate in Berlin. The origin of the palace's name is derived from the layout of the facade stuctured of gray and white marble mixed with red bricks. The origins of the City Palace go back to 1662. From 1744 to 1752, the baroque structure was extended and redesigned by Georg Wenzeslaus von Knobelsdorff, the court architect of Prussian King Friedrich II. Like most buildings in the historical center of the town, the palace was destroyed by an Allied bombing attack three weeks before the end of the Second World War. The reconstruction of the palace, which used to be the winter residence of the royals, was completed in 2013. Today it houses the parliament of the state of Brandenburg. In northern Potsdam, at the foot of the Pfingst Hills, lies the colony of Alexandrowka. Formerly a Russian military settlement and home to Russian singers of the Prussian army, it comprises thirteen ornate blockhouses with a warden's residence, a regal country house as well as a Russian Orthodox chapel up on the hill. The Alexandrowka colony was established in 1826-27 by order of Friedrich Wilhelm the Third, in memory of his late friend Tsar Alexander the First. A museum can be found in House Number 2, which provides visitors with an insight into the colony's past. Das Holländische Viertel - The Dutch Quarter: A touch of Dutch. This picturesque housing estate and collection of buildings in the Dutch style, commissioned by Friedrich Wilhelm the First - known as the Soldier King and father of Frederick the Great - was designed to house the Dutch artisans who helped colonise Potsdam between 1734 and 1742, is a "must see" stop on the tourist trail. It is comprised of four blocks with a total of 140 gable-fronted, brick-built houses. Although it is undergoing gentrification and commercialization, the Dutch Quarter has largely preserved its architectural and historic integrity and this bohemian district still offers a wide selection of boutiques, antique and bric-a-brac shops, as well as cosy cafés and restaurants, providing the perfect environment for a relaxing and enjoyable stroll. The Jan Bouman House, a museum at Mittelstrasse 8, showcases the history of the neighborhood. The Nikolai Church, Fortuna Gate and the Museum of Film. Few other places allow you to experience so much history at first hand. The Potsdam Castle, which was rebuilt with the Fortuna Gate, serves to remind us of this. Nearby is the Museum of Film. This red building, once the Prussian Royal Stables, began life in 1685 as an orangery. It took its present form in the 18th century from no lesser arquitect than Georg Wenzeslaus von Knobelsdorff, who was also responsible for the building of the Sanssouci Palace. In the direct surroundings are the Nikolai Church, a classical sacred building by Karl Friedrich Schinkel, as well as the marble obelisk in the middle of the market square, the old Town Hall with its gilded statue of Atlas, and the "Knobelsdorffhaus", a building inspired by the Marble Hill House, a Palladian villa near London. After highlighting the town's unique cultural status, we would like to draw attention to its flourishing dining scene. Potsdam is one of those places that mix culture, history and eating well, the town's best restaurants are a toast to all your senses. The food scene of Potsdam stands out for its appreciation of regional products such as fish, wild boar, vegetables, sausages and a variety of smoked produce. See our list of Potsdam's best restaurants..
Next to the historic windmill and Sanssouci Park is the charming restaurant "Zur Historischen Mühle" which is part of the famous Swiss Mövenpick network. With a large outdoor area, this restaurant / café is specializing in local meat, fish and delicious pastries. Zur Historischen Mühle offers weekly and quarterly menus, you will always find regional dishes made with fresh, seasonal ingredients in a unique environment. The restaurant is a good option for those who want to combine a visit to Sanssouci Palace with a pleasant and uncomplicated dining experience. Formerly the country seat of the Prussian royal family, is situated right behind Sanssouci Palace. Now lavishly fitted out in the style of a "Hofbräuhaus", visitors are invited to partake of Brandenburg's finest food and drink. Much is made of the brew known as `Bornstedter Büffel`, Habel's winery, the court bakery and Café Victoria. Brandenburg's long-established handicrafts are carried on here. Millers, weavers, candle-makers, and those working in pewter and ceramics ply their trade in the time-honoured fashion, visitors can purchase the finished products from the craftsmen at popular prices.